To show that there is nothing new under the sun, here is a belt drive turntable with a weak motor and a heavy platter, an underslung counterweight and a lid that you had to pay extra for, just like the ones still on sale today! It may seem familiar, but the Thorens TD 150 seen here first went on sale in 1965, that’s nearly fifty years ago. Then, as now, the thing that set in apart from most other turntables was a suspended sub-chassis, a floating platform inside which holds the platter and arm base rigidly together, but which otherwise moves freely in space with the aim of providing prefect isolation from external vibrations. 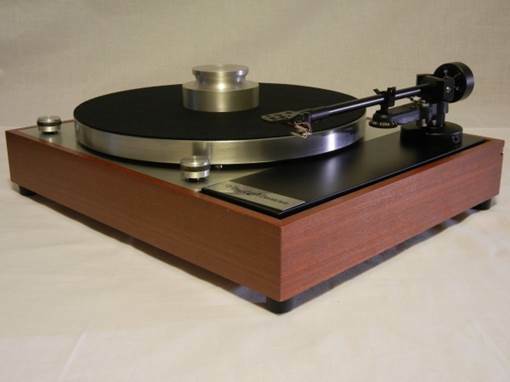 The TD 150 was not first turntable to be built like this, but it was the first to sell in large numbers, thanks to its fine sound quality and remarkably low price. Many imitators followed in the next decade and I think it’s not too unfair at this point to remark on the physical and engineering similarity to the mighty Linn Sondek LP12, no less. And don’t forget Ariston, STD, Systemdek, Rovolver, et al., either! 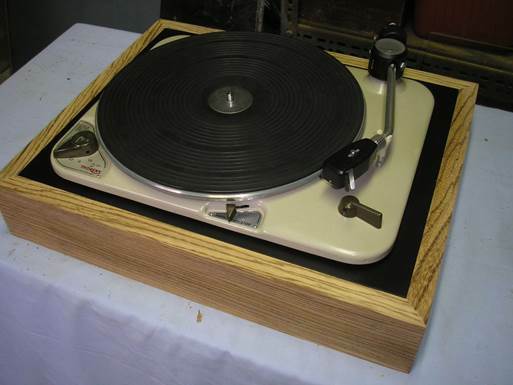 Before the suspended sub-chassis, turntables had been typically constructed on a pressed steel plate to which the various items – arm, bearing, motor, etc. – were all attached. The motor was usually mounted on rubber bushings in an attempt to stop the vibrations it produced reaching the record and stylus but these were largely bypassed by the idler drive mechanisms which were popular at the time. 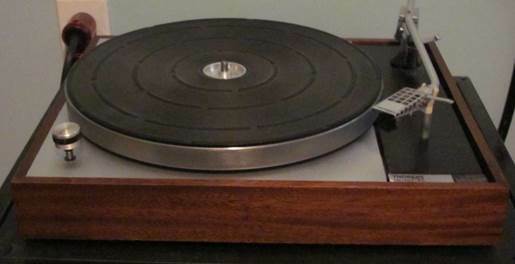 The complete turntable unit was sometimes mounted on coil springs too, to try to block some the very low frequency vibrations that may otherwise spoil the sound, Thorens offered a machine of this type in the early sixties, the TD 135, which was very much a typical design of this period – you can image how slim, neat and modern the TD 150 must have looked in comparison. In the TD 150, the platter floats softy just above the top plate, and when it is moved the arm and the black arm board beneath it move with it together. It is essential in the design of any turntable that the relationship between the axis of the arm and the platter is constant and in the TD 150 design this is achieved by two shallow steel channels which are spot welded together into a ‘t’ shape, the cross of the ‘t’ holding the arm board above. This assembly is suspended on three compressed coil springs located radially movement only loosely constrained. The motor is mounted solidly to the plinth and a flat rubber belt too the platter acts as a mechanical low-pass filter which transmits the drive, but blocks the bulk of the vibrations. Belt drive turntables were not new in 1965, but even so it was still an unusual feature. Because of the high quality main bearing and the absence of any turntable driven automatic function, a very small and light motor, similar to those found in electric clocks, was used. Being a synchronous design its speed was locked to the mains supply frequency, not its exact voltage. The motor required around 115V, so for those examples sold in Europe a resistor was fitted to drop the excess voltage – if your TD 150 smells slightly of burning when first switched on then dust harmlessly burning off this resistor us likely to be the cause. Conversion of a USA-spec example is not easy though different diameter pulley is needed but since this is solidly bonded to the motor shaft a whole new motor would still be required. The TD 150 was available in four versions, as a motor unit only (no suffix), with a Thorens TP 13 arm but no plinth (suffix A), with a plinth but no arm (suffix B) or complete and ready to run except for a cartridge (suffix AB). In the case of the B version, the blank arm board could be drilled anywhere to suit most arms, but the machine’s small size precluded the use of the popular SME 3009 unless an SME plinth was used as well.